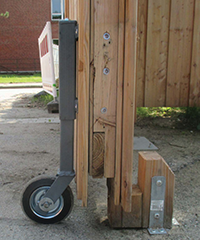 Gas Springs Help Heavy Wooden Gate Roll Over Uneven Ground – ACE Controls Inc. Sometimes even the simplest thing, like attaching wheels to a heavy object, can create engineering challenges—something Jorkisch recently overcame with the help of industrial gas springs from ACE Controls. Sometimes even the simplest thing, like attaching wheels to a heavy object, can create engineering challenges—something Jorkisch recently overcame with the help of industrial gas springs from ACE Controls. The problem. In general, when wheels are mounted under uncontrolled weight, overcoming unevenness in the ground is difficult. Like a car driving over a bumpy road, the wheels, which must support the weight of the car, have the tendency to jerk left or right—causing potential damage to the wheels. To avoid this phenomenon, mounted wheels should be able to move freely without having to support the load. The solution. To support the weight of the door, Jorkisch technicians integrated ACE industrial gas springs into the wheels’ metal supports. Depending on the size, these maintenance-free, adjustable components can handle forces up to 13,000 N, provide up to a 1,000-mm stroke and operate via pressurized nitrogen gas. ACE engineers fill the springs with the gas according to an application’s individual pressure requirements. In this case, technicians selected a 40-mm model (type GS-40-200), which can deliver forces up to 5,000 N.
The results. 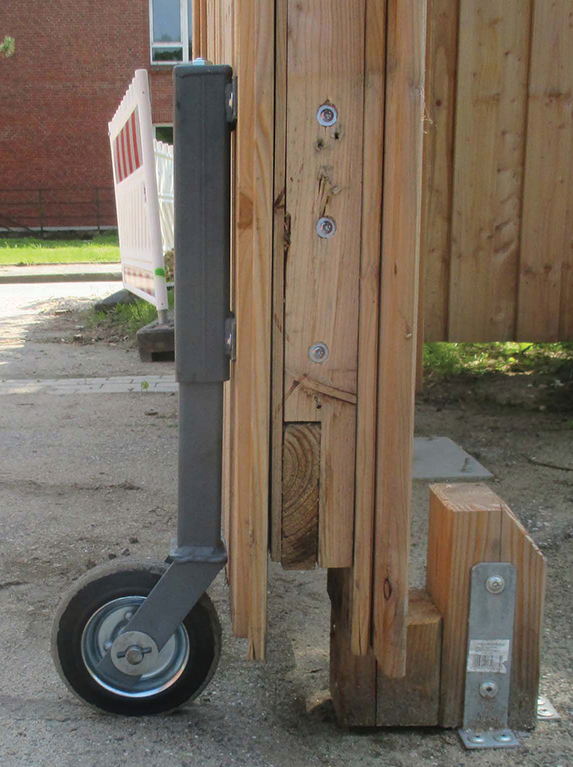 Thanks to the springs, camp personnel have been able to roll the wooden gate with ease despite the uneven ground—and the customer is confident the components will stand the test of time.